If Snoring is a problem or you suspect you have a sleep disorder, contact us. Dr. Blincoe may be able to offer a dental solution for a medical condition - obstructive sleep apnea - while also reducing, minimizing and sometimes eliminating snoring. 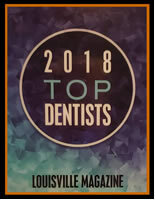 Dr. Blincoe is a member of the American Academy of Dental Sleep Medicine and the Kentucky Sleep Society. He is trained in the fabrication of dental devices to help manage diagnosed obstructive sleep apnea and snoring issues. The Epworth Sleepiness Scale measures certain factors to see if you show symptoms of a sleep disorder. The STOP-BANG Questionnaire measures factors to see if you are a risk for Obstructive Sleep Apnea. Click on the links above to take either or both tests. To learn more, contact our office and set up a consultation with Dr. Blincoe. Give us a call at (502) 895-2210 or e-mail us at blinshut@bellsouth.net. Is snoring bad for you ? Snoring is an indicator for Sleep Disordered Breathing (SDB) and / or Obstructive Sleep Apnea (OSA). Sleep apnea exacerbates diabetes, heart disease and high blood pressure to name a few. Snoring and sleep problems need to be investigated. Take our tests listed above to check out your risk factors.